Another Goldwyn girl that never broke from the uncredited tier. Nothing new here, but Virginia Cruzon was so much more – she was a true and blue working gal who supported not only herself but her mother and seamlessly switched to a career in the oil industry after her Hollywood years were over. Virginia Monroe was born on May 25, 1921, in San Francisco, California to Albert Harold Monroe and Mabel Maude Babb. She had four older brothers and sisters: a unnamed sister, who was born in 1908 and died a few months later in 1909, Phyllis Morine, born in 1909, Muriel Nadine, born in cca. 1913, Harold Richard Monroe, born in 1916. Her parents divorced not long after her birth. In 1930, she was living in the house of Garfield Stanley Kirkpatrick, with her mother acting as his housekeeper. Virginia attended high school in Los Angeles, but completed only the first two grades before dropping out to try her hand at the showbiz career. She worked as a usher at the Grauman’s Chinese Theater and graduated to a chorus girl not long after. She worked for five, six years before becoming a Goldwyn Girl (she was also an Earl Carroll girl for a brief time), and then got into movies. Virginia had two breaks into movies before she finally settled into it (but she never did get any credits). Her first experience was in George White’s 1935 Scandals. For ambitious chorus girls who wanted to taste the movie life, George White’s movies were paradise. A man well known for his taste in women, and, much like Busby Berkeley, George White made lavish musicals featuring a large number of dancers. Also like Berkeley, his movies had a paper thin plot, the lead was normally a Mary Sue and characters were mostly one dimensional. The above mentioned movie is no different, it’s pure escapist fare you watch once and forget soon after. The charismatic lead, Alice Faye, lends the movie a warm flavor but it’s not a top achievement. Fast forward to 1941, and to Virginia’s second movie, Ziegfeld Girl. Co directed by Busby, top notch production values and with several huge stars in the cast, what could go wrong? Nothing did go wrong, but it’s most definitely not a legendary movie well known to the masses like Gone with the wind. And then again a hiatus from the industry. Virginia made the cusp of her filmography in 1944/45. Up in Arms was her last Goldwyn girl appearance. As mentioned several times of this site, it’s a fluffy, happy go lucky movie, perfect for a Sunday afternoon viewing, with very charming leads (Danny Kaye and Dinah Shore). Having Wonderful Crime was one of Carole Landis’s last worthwhile movies. She would die three years after the movie was released, in 1948, but the rest of her filmography is dismal to say at least. While this movie is no big work of art, it’s still a decent screwball comedy. Some gags are repetitive and hardly funny, but Carole Landis is superb in her role, and George O’Brien is as good as usual in his stock role. The story of course, expects a total suspension of belief on the side of the viewer, but that is to be expected from a WW2 comedy. A Thousand and One Nights is the movie that gave the people what they wanted – exotic escapism. it’s full of colors, fancy costumes and endearing musical numbers. Characters come and go, there is no structure of indeed a decent plot, but who cares? it’s not that kind of a movie to start with. Conrel Wilde and Evelyn Keyes make a handsome couple. Virginia had more of the same by appearing in George White’s Scandals. Nothing more needs to be added. A typical George White movie with Virginia in the chorus. Shadowed was a run of the mill Columbia crime quickie. One Sunday Afternoon isd a movie that tries to chew more than it can swallow – why? Because it’s a remake of “Strawberry blonde“, a superb movie with James Cagney, Rita Hayworth and Olivia de Havilland. Need I mention that surpassing one of these thespians is hard work, but surpassing all three is down right impossible. Cagney owns the rough but lovable Irishman stereotype and nobody, but nobody could put him in shade. Dennis Morgan, the lead in One Sunday Afternoon, was always a passable actor bu tno big talent (he was a great singer, but actor? Meh). Janis Paige and Dorothy Malone, while very good actresses in their own right, do not peg down the roles sufficiently. The end result is a pale remake, completely overshadowed by it’s older brother. Emergency Wedding was a bright spot on Virginia’s filmography. It’s a low key, funny, gentle movie about male-female relationships and the meaning of work in one’s life. The cast is made out of highly reliable actors and actresses that never achieved huge fame – Larry Parks, Barbara Hale, Willard Parker, Una Merkel and so on. Great comedic moments, good romantic tension, a clear message, it’s a movie that shows what was so right with Hollywood in the 1950s. Virginia retired from movies after this. Virginia came into the media spotlight after Ziegfeld Girl. The movie had some extensive publicity, with the Ziegfeld girls from the movie wearing the newest fashions and doing tours all over the US. A brilliant press agent send Virginia and Myrna Dell to New York for the festivities to promote the movie, and claimed both never set foot outside Los Angeles county. Since Virginia was born in San Francisco, it’s clear what a fad that was. The press was also inventive in her life story: she was depicted as a poor girl working in a factory who was pushed out of that mundane life by a talent scout who started pulling strings to have her become a chorine. 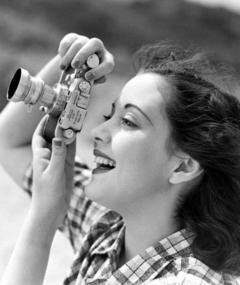 Not quite true – in 1940, her official occupation was being a photo model, not a factory worker! 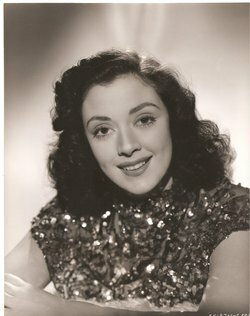 Virginia continued to appear in variety and revue shows even after her movie career started, and supported her mother all the while. 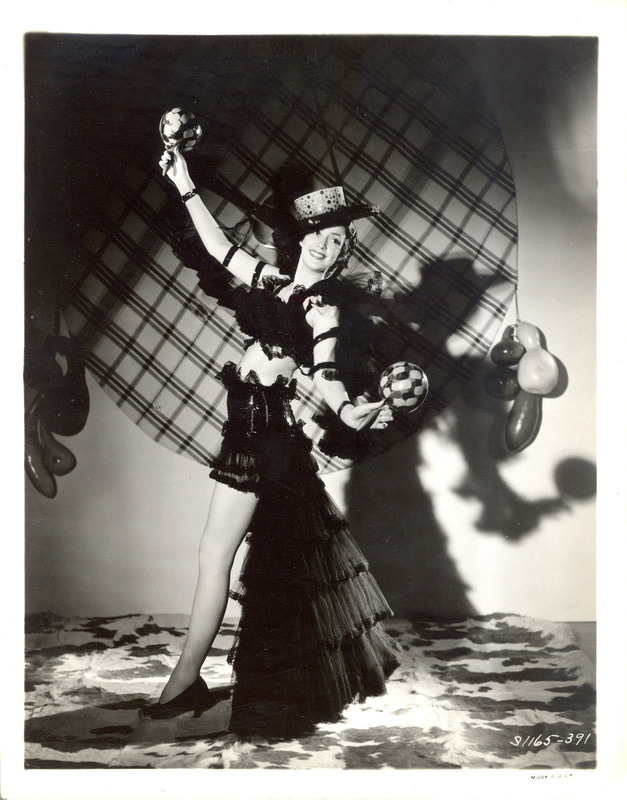 She appeared as a in Ken Murray’s Blackouts several years in a row, proving her mantle as a comedienne. Virginia’s first known beau was producer Robert “Bob” Sherwood. Nina Orla was also vying for his attention, but Virginia won hands down. Virginia married Rex W. Whaley, a movie splicer, on May 29, 1944 . Whaley was born in Oklahoma in 1918 and since the 1930s lived in Los Angeles where he raised his three younger sisters with the help of an aunt. Virginia gave up movies not long after for started working for the Chevron Oil Company. She and Rex resided in Glendale in 1955. They divorced in 1956. Virginia married Stephen H. Sanders on April 26, 1957. Their daughter Virginia Jocelyn Sanders was born on June 3, 1958. They divorced in February 1968. Virginia retired from Chevron Oil Company in 1988, and moved to Lamarie, Wyoming to enjoy her golden years. Virginia Sanders died on August 21, 2010, in Lamarie, Wyoming. Joan Chaffee went from a college educated high society girl to brief flashes of glory in the papers as another one of the Goldwyn Girls, only to end up in obscurity a very short time later. Elizabeth Joan Chaffee was born on January 19, 1925, in Los Angeles, to Harry Chaffee and Frances J. Anderson, their first and only child. Her parents lived in Beverly Hills and were very well off. Joan grew up in a loving, nurturing environment and started dancing as a child. Her parents divorced in the 1930s, and she continued living with her mother in Beverly Hills. In 1943, she enrolled into the UCLA. She did some amateur dramatics at the UCLA theater and was noticed by a talent scout who steered her towards a movie career. J oan appeared in only two movie, and both were uncredited. What a waste! She was one of the many Goldwyn girls in Up in Arms, a nice, fluffy, happy go lucky movie designated to make your day a bit sunnier. While not a masterpiece by any account, not something so deep it will leave you thinking, it’s more than adequate for the musical escapist fare. The cast, Danny Kaye, Dinah Shore, Dana Andrews and so on, are all very good . Her second and last movie was Belle of the Yukon is solely remembered today as a showcase for the famous burlesque star Gypsy Rose Lee. And add an impressive roster of B tier actors. Nothing else is especially notable about it. No tension, muddled plot. Joan retired from movie acting afterwards. Very slim information here. She hit the papers in 1942/1943, but it was never related to her personal life. In 1943, she was a part of a publicity stunt devised by Sam Goldwyn to shame a hermit living in Los Angeles Hills into taking a job and living a more typical existence. One afternoon Goldwyn sent sent the Virginia Cruzon, Dorothy Garner, Virginia Mayo and her to do the picketing, plus two photographers to record it for the papers. Joan left movies in 1944 and got married not long after. She entered a new career in 1945, but the paper refused to disclose it, claiming it was all hush hush, so I never found out what exactly did she do. She got divorced from her first husband prior to 1950. Joan married her second husband, William E. Watson, on June 7, 1952, in California. William was born in 1922. Joan divorced her husband at some point and moved to the East coast. She became a film editor, and worked in New York City until her retirement n the late 1990s, when she moved to Connecticut. Joan Chaffee died in Sharon, Connecticut, on April 4, 2002.